Almost half of UK adults travelling to areas at risk of malaria are not covering themselves by taking medication, despite recommendations made by the NHS and world health organisations. New research by pharmaceutical company Maloff Protect, reports 48% of Britons do not believe they need to take antimalarial medication when travelling to areas prone to the disease. A widespread misunderstanding about the disease has prompted researchers to try and raise awareness, with around four million people travelling from Britain to areas prone to Malaria. Over 1,400 people came flew back to the UK with malaria in 2015 alone, and six of these cases turned out to be fatal. 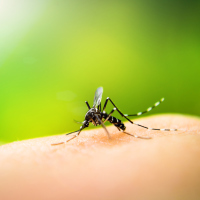 Malaria is transmitted to humans by mosquitoes, typically in tropical and subtropical regions. The mosquito transmits parasites into the bloodstream, which multiply in the sufferer's liver before infecting and destroying red blood cells. According to the NHS website, taking antimalarial medication before travelling can reduce the risk of the disease by up to 90%. There are more than 90 countries worldwide that are prone to malaria. However, the data also shows almost a third (32%) of UK adults do not know that they could be at risk of Malaria in Africa, despite 90% of cases recorded being from the continent. Some 92% of malaria-related fatalities also originate there. More than two thirds (72%) of people aren't aware that Central America is a high-risk area and 47% are unaware it's prone on the Indian subcontinent. Make sure you're covered for medical conditions when travelling worldwide with our comprehensive worldwide travel insurance.